Membership is open to any individual with demonstrated experience in the area of brief interventions for alcohol problems, either from undertaking research or having implemented interventions in one or more settings. • All participants in the WHO Phase IV collaborative project on the Development of Country-wide Strategies for Implementing Early Identification and Brief Intervention in Primary Health Care. • All participants in the EU- project on Integrating Health Promotion Interventions for Hazardous and Harmful Alcohol Consumption into Primary Health Care Professionals’ Daily Work (PHEPA Project). • All participants in the WHO collaborative project on Dissemination of Brief Interventions for Alcohol Problems in Primary Health Care: A Strategy for Developing Countries. Membership is also open to any individual with a bona fide and active interest in conducting research on or implementing in practice alcohol brief interventions. 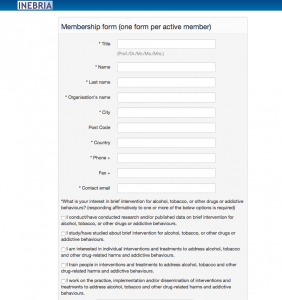 Membership is open to individuals (not institutions) although individuals may be recognised as representing their institution’s interest in alcohol brief interventions. Those of you interested in joining the network please fill in the registration form online.